Midnight Sun, the new album from the Gothard Sisters was written in contemporary Celtic folk style and with their uniquely distinct- arrangements and each of them tells a little story about something special to the three of them, thanks to hours upon hours in the studio and thanks to the energy and commitment to learning demonstrated every day by adventurous engineer, Kent Harrison at Sammamish Sounds. This new album by the northern Washington sisters is as good as they come in current Folk and Celtic and Pop Rock, with just a twist of singer/songwriter style for which the album comes recommended. “Midnight Sun” is the title cut and it is nothing short of a grand opening salvo worth hearing and taking in at high volume to impress to its fullest potential. The Gothard Sisters are seasoned pros with a flawless opening track that puts any doubts away about how the album will play out. This starts to burn instantly once “Against The Grain” comes pumping out of the speakers with its awesome assortment of instruments that weave in and out of each other like there is no tomorrow. It really does get the Celtic blood pumping for Irish Folk dance lovers. It fits right into their world. “Wandering” is a song that deals with some of their experiences out on the road, as do a few more songs on Midnight Sun. This one in-particular is an album highlight, which has some of that mentioned singer/songwriter twist they share as artists together. So does “Hummingbird” which is another stellar instrumental track, one of the album’s spiciest arranged songs. This is a real joy to listen to, but there is not one bum note to be heard on the album either. If you’re not fond of their type of music, you probably will be once you hear this first-rate world-class album. You’ll be blown over by the likes of “Mermaids” with its high seas stormy theme that never lets you go. 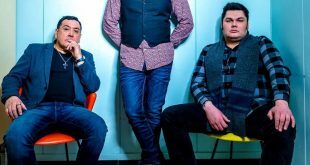 It’s one of the featured tracks on the album, it’s just an amazing piece of work, as is “Elderflower March” which is another song of interest in the singer/songwriter department with another album highlight. The songs are so fantastic it’s almost more than an album, and that’s not something you get without releasing a double album. Check out “Bells On The Hill” for instance, it’s another remarkably great track with the sister doing what they do best, and leaving no stones unturned. 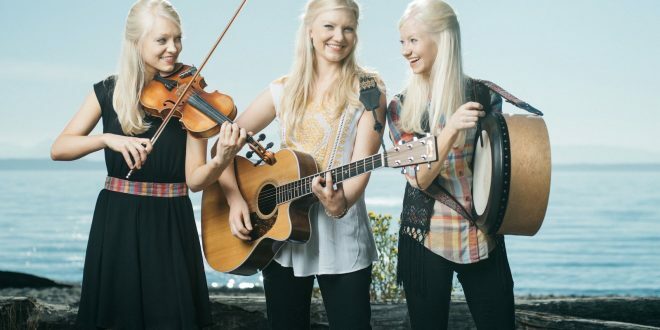 Then there is “Cat In The Fiddle” and you are sinply won over my the majesty of the Gothard Sisters, a band that didn’t just come out of nowhere, and have been playing as a trio since at least 2006 and it’s easy to see why they’re at the top of their genre. They even brought in composer and pianist, Michele McLaughlin, for a smoking appearing on “When The Rain Falls,” which is as good as anything included on Midnight Sun. It isn’t hard to partake in the rest of what’s to come before “Colors Of Home” ends things on a surreal note with another epic song for Folk lovers, and the Gothard Sisters let all their emotions hang out on this mighty closer.